The TLC Bikes crew laded up for a trip to The Base Skatepark and Southsea Skatepark! Here’s a look at what the TLC Bikes team got into during a recent road trip to hit up The Base skatepark and Southsea Skatepark for some riding time. Here’s a look at the riding clips these guys stacked! Plenty of real solid riding in this one with a good mix of tricks and styles. “We recently took a trip down to Bognor Regis and Portsmouth to hit up The Base and Southsea skatepark with a few members of the team. Here’s a quick summary of the trip, enjoy! Mark Webb just uploaded this highlight reel from the King of Southsea Skatepark. This is a mix of footage from all the different classes, but mostly from the pro and expert classes that had some damn good riding go down! Hit play and take it all in! We’re not quite sure if this was a full on contest, or just something fun since it looks like it was pretty laid back and looked a lot like a proper session. “Thank you to everyone that attended Southsea Skate Park for the ‘KING OF SOUTHSEA’ Here is some footage from through out the day. If you caught any of Mark Webb‘s recent videos, there’s a good chance you heard him mention that he has been working on “The Webbie Show 3”, the third in his series of absolutely mental BMX videos. Well, today the video dropped and Mark came through with an absolute banger of a video from the Southsea Skatepark that is filled with crazy technical lip tricks to massive blasted tricks out of the baox jumps and quarterpipes. Mark absolutely crushed this! Did you ever see the other 2 “The Webbie Show” videos? Mark Webb has been back on it with the filming lately. Here’s another video from a session at the Southsea Skatepark with Tom Justice and pro scooter rider Archie Cole. As you can imagine with Mark and Tom, both of these guys dropped some heavy moves from technical lip tricks to big blasted airs. So, if you’re looking for some dialed ramp riding, this is the one for you! Mark Webb coming through with a fresh video from a session at the Southsea Skatepark with Alex Coleborn and James Ross! If there’s one thing you should know about that line up, it’s that these guys are absolute machines when it comes to riding a park as good as the Southsea park. Check out a TON of dialed clips they stacked during the session. Flips, whips and more! It never fails to blow my mind that such young kids are able to ride the way they do now days. Troy Hayward, who is 12 years old, and Owen Watson, who is 14, teamed up at the Southsea Skatepark to film this new edit that’s loaded with some great riding. It’s edits like this that remind me that BMX has a really crazy future. I’ve been waiting on the flyer for this one to drop… Effraim over at Flat Matters, who is also the manager of the Southsea Skatepark, is bringing back the King of Concrete contest at the end of August! I have a feeling this will be a big one since they always were back in the day! Check out more info below and get stoked if you’re in the U.K! “King of Concrete is back! August 23-25th 2013. Hosted by Flatmatters at Southsea Skatepark. We are excited to announce the return of one of the longest running competitions in the history of BMX, King of Concrete, presented by EXTREME. The legendary skatepark contest is scheduled for the traditional date, August 23-25th, August Bank Holiday weekend. 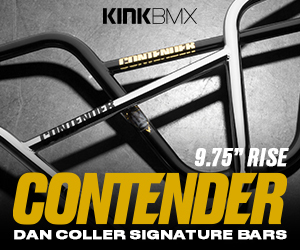 The King of Concrete competition utilises all areas of the skatepark. Classic Bowls, Fun box Challenge, Highest Air in Keyhole, Flatland, Spine Mini, Vert, Highest Bunnyhop, and Street over the course of the August Bank Holiday weekend. Who can stack up enough points in all events, in the Pro and AM classes to win the King of Concrete, and Prince of Concrete titles? Hope to see you on August bank Holiday weekend! It’s been a minute since I’ve seen some fresh clips from Farren Downes. Check out 5 fresh clips from him getting some time in at the Southsea skatepark. Definitely some real good riding in this!